The leaders in last year's New York Marathon. 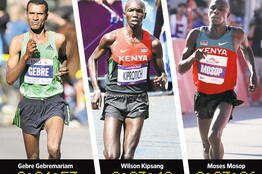 Winner Geoffrey Mutai is fourth from left. Amid the continuing debate over the wisdom of proceeding with Sunday's New York City Marathon, the world's best distance runners are focused on more than just the glory of winning the race. The elite of the elite in marathoning is chasing a larger, longer-term goal—the pursuit of breaking two hours in distance running's glamour event. Geoffrey Mutai's world-best 2:03:02 in the 2011 Boston Marathon put the world on notice that the two-hour barrier was getting eerily close to striking distance. (It didn't count as an official record because the course doesn't meet international standards; too much downhill, too much potential tailwind.) Five months later, Kenyan Patrick Makau lowered the official world record to 2:03:38 in Berlin. "It's going to happen in my lifetime," said Meb Keflezighi, the silver medalist in the 2004 Olympic marathon, who will compete Sunday in New York. "This is like Roger Bannister and the four-minute mile. No one had done it before him, and now we're nearly 17 seconds beyond that." Breaking two hours in the marathon will be an utterly lung-searing achievement, even for the Ethiopians and Kenyans, who dominate distance running. Whoever breaks through the long-unfathomable barrier must average better than 4:35 per mile for 26.2 miles. As astounding as Mutai's feat was—with Kenya's Moses Mosop just four seconds back—he was still about 1,100 yards short at the two-hour mark. 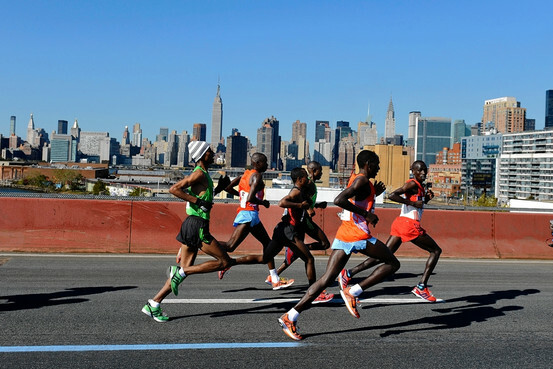 The three runners in Sunday's New York City Marathon with the fastest times. Jason Gay: Are We Really Going To Run This Race? NYC Marathon -- Too Soon After Superstorm Sandy? However, in 2010, Zerisenay Tadese of Eritrea ran a half-marathon in 58:23, a pace of about 4:27 per mile. In the small world of elite distance running, breaking the two-hour barrier has left the realm of "if" and has become a matter of "when?" and "who?" The official marathon world record is falling at faster clip than other world records. Makau's record time is 4.2% lower than the world record time in 1980. The world record in the 100 meters is down only about 3.5% during that time. The men's 110-meter hurdles record has barely budged, down only 1% since the 1980s. 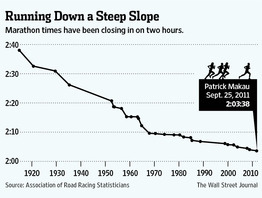 The men's 1,500-meter record has dropped 2.3% since 1983. Theoretically, human beings should be improving at all distances at the same rate. No one doubts there is some limit to how fast a human can run the marathon. Moreover, in a post-Lance Armstrong world, the specter of performance-enhancing drugs looms over every remarkable endurance accomplishment. But setting that concern aside for the moment, the 120-minute barrier is now close enough for a special outlier—a long-distance version of sprinter Usain Bolt—to emerge and make a run at it. 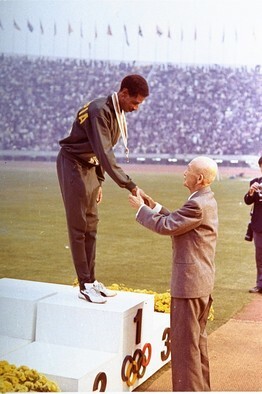 Abebe Bikila at the 1964 Olympics. "The question is whether there is a superstar like (Abebe) Bikila in his prime," Bill Rodgers, the former New York and Boston Marathon champion, said of the late Ethiopian champion who won consecutive Olympic marathon gold medals in 1960 and 1964. Researchers say according to conversion tables that attempt to line up world records for different distances, the marathon record is actually somewhat slower than it should be. "It's a little soft right now," said Michael Joyner, an anesthesiologist at the Mayo Clinic and a leading researcher in endurance sports. Joyner, who once ran a sub-2:26 marathon, said a correlation with the world records in the 10,000 meters and the 5,000 meters and the marathon suggests "someone out there should have run about a 2:01:50 by now. Getting another minute or two off the current world record shouldn't be a problem. We'll see about it after that." Humans are undoubtedly up to the task physiologically. The species owes its survival to endurance running, said Daniel Lieberman, a professor of evolutionary biology at Harvard. Humans are slow compared with most mammals. Bolt, the fastest human we know of, runs only about 10.4 meters per second. "I could take any sheep out of a pen and it could beat Bolt in a short race," Lieberman said. And yet, humans and our ancestors have been hunting and eating meat for some two million years. Hunting tools are relatively new inventions, Lieberman notes. A bow and arrow, for instance, is only about 100,000 years old. But Lieberman says we have long been able to run our prey into heat exhaustion, thanks to our springy feet, long Achilles tendons, large, strong rear ends, and the ability to cool ourselves down by sweating. Other mammals pant, but they can't pant and gallop at the same time. In recent years, men have occasionally beaten horses in long distance races. 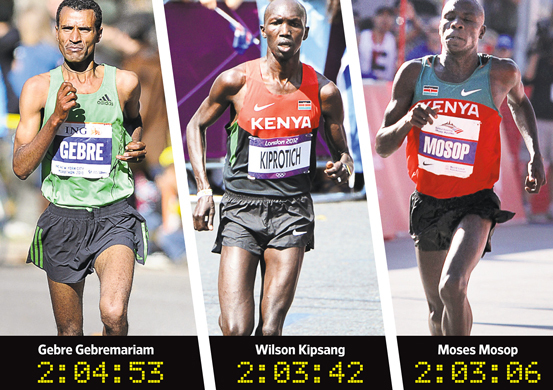 Lieberman isn't saying a sub-two-hour marathon is inevitable. "Natural selection doesn't care one iota about the performance of the elite members of the species at distance running," he said. The continuing acceleration in elite performance in the marathon may have more to do with the economic, sociological and demographic factors that are expanding distance-running's talent pool than it does about physiology or even training methods. However, the fact that much of the recent progress has been made without much innovation in training could mean the two-hour barrier is within reach, said Yannis Pitsiladis, a researcher at the University of Glasgow's College of Medicine, Veterinary & Life Sciences, who has studied elite distance runners in East Africa. "The current thinking is that it will fall sometime between 2020 and 2030, but I think it can happen much sooner, perhaps as soon as the next five years," he said. "We haven't really used much science yet in training." Indeed, training regimens haven't changed much since the early days of the running boom in the late 1960s. Pitsiladis and others are still trying to figure out exactly how training could be modernized. Amby Burfoot, who won the 1968 Boston Marathon while still in college at Wesleyan University, said he was doing intense distance training back then that isn't unlike what the top marathoners do today. He averaged about 125 miles per week. A month before his win in the Boston Marathon, he ran 350 miles during a two-week training trip to Quantico, Va.
"There are no supersecret workouts out there," says Burfoot, now an editor at large for Runners World. "People who run fast and win marathons have a lot of talent and they train really hard." At the root of the improvement, experts say, is the professionalization of the sport, which has allowed the best athletes to pursue marathoning without holding down another job. When Rodgers began to win marathons in 1970s, he was a middle-school special-education teacher. He'd win a marathon and be back in the classroom by the middle of the week. Beginning in the 1980s, however, prize money and sponsorship dollars from shoe companies started to become sufficient enough for the best runners to begin to make a living at their sport. The winner of Sunday's New York marathon will collect $130,000, or $200,000 if he is a repeat champion. Marathon money has helped spark a boom in distance running, especially in Africa where the sport has long been embedded in the culture and average income hovers between $200 and $800. The top 15 lifetime money winners in distance running were all born in Africa, including Ethiopia's Haile Gebreselasie, considered the most talented distance runner in history and the former world record holder in the marathon. Marathons now account for about two-thirds of all road racing prize money, which has encouraged the most talented distance runners to focus on the distance from the start of their careers. "With all that money, are you going to concentrate on the 5K or 10K or go right to the marathon?" Keflezhigi said. Marathoning itself has exploded, too, improving the chances of the sport capturing a long-distance version of Bolt, who is almost perfectly designed for speed. Last year there were 2,986 marathons world-wide, compared with just 297 in 1972. More races mean more athletic children think of pursuing long distance running, especially in places like South America and China, where the sport still has significant room to grow. Researchers now understand what the person who runs the first sub-two-hour marathon will look like. He should be fairly small, probably shorter than 5-foot-7 and weighing about 125 pounds. A small body has less surface area and can cool more efficiently than bodies with more surface area. He will also have a freakish ability to move oxygen through his body, but run fast using limited oxygen—an attribute likely helped by being born and growing up at high altitude. "I know this," Rodgers said. "It will be broken by someone who believes it can be broken." A version of this article appeared November 2, 2012, on page D1 in the U.S. edition of The Wall Street Journal, with the headline: Breaking the Two-Hour Marathon Barrier.